As a result of excellence on several levels, Bruce Sullivan is now an integral part of Swim Australia’s substanial growth and development. Bruce Sullivan has appeared almost annually since 1995. He has addressed various streams at the Convention, ranging from learn-to-swim teachers, swim school managers, age group coaches … up to the National Team Coaches, Management and Support Staff. Topics have included staff development, marketing, customer service and team building. On all occasions Bruce has received ‘top marks’. Speakers are evaluated on content and presentation; Bruce being awarded 5’s (excellent) on both counts. The keys to Bruce’s success is his ability to tailor professional-business concepts to industry-specific needs and present same in a thoroughly entertaining manner. Consequently, Bruce was engaged, with Laurie Lawrence, to be the Keynote Speakers at the inaugural International Swim Schools Conference conducted in Fiji during August 2005. His unique blend of education, entertainment and inspiration ensured the event was an outstanding success. 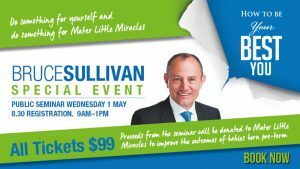 Bruce will be the headline ‘act’ when Swim Australia again host this Conference in 2009. Bruce has so impressed our American delegates that our sister organisation, the US Swim Schools Association, have engaged him for a number of their key events.